Media selection comes from articulating artmaking goals to communicate to a specific audience. The facilitator helps the participant select the media most appropriate. Photo: Judy Chicago comments on Luigia Martelloni’s video. 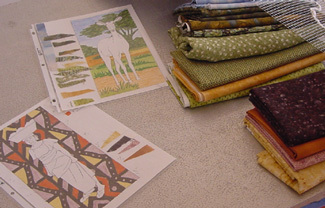 Photo: Julie Kornblum’s designs and fabrics. 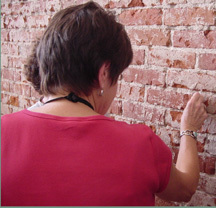 Photo: Anna Friesen uses the brick wall as her medium.